So, I don't really want to get into the two comics in too much detail, but there was a very specific problem happening with Justice League of America and Countdown Arena this week. Consider first the infinitely unlikely coincidence of any Tangent comics character being referenced twice in one week. 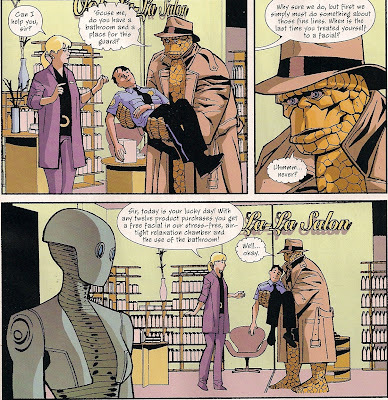 Now let's add the improbability that the same Tangent character is being used in two separate series...and that one of these comics completely contradicts the events of the other. 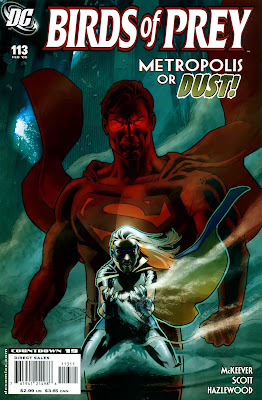 I mean, I don't care to see the Tangent comics Flash in any of my books, but I certainly don't want her to be teaming up with the JLA in one book, and dying horribly in another at the exact same time. I mean, really, what are the odds that the same RIDICULOUSLY obscure character is being used twice in one week, and that they can't even get THAT to sync up?! In related news, I dropped JLA from my pull list this week. I gave it a more than fair chance, and this issue was beyond terrible. 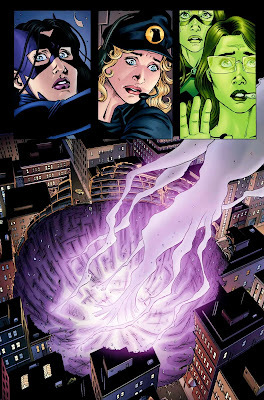 Never in my wildest dreams would I expect to drop a JLA comic written by Dwayne McDuffie, but here we are. Yargh. I almost barfed on my comic, which would have reduced its condition to poor and I would not have been able to return it to the store. But seriously, DC. Nothing? Last year you guys had that great Xmas issue of JLU, and then the half decent Infinite Christmas Holiday special, PLUS a festive issue of 52. And this year not even a festive installment of Countdown?! What's wrong with the DCU? It's a world of dread and fear, where the only water flowing is the bitter sting of tears. Do they know it's Christmastime at all? And don't think you're getting away easy, either Marvel! What If Civil War?! That's not even a question! 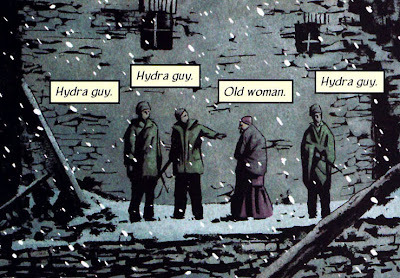 And the inside was, like, what if Civil War was written correctly the first time. But with much worse art, at least in the second story. 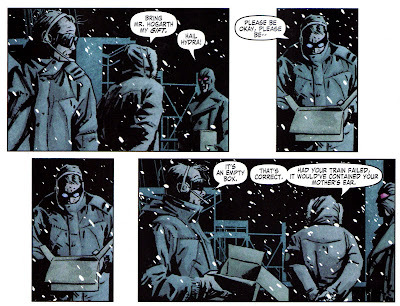 The Marvel Christmas Special was, however, very fun. Particularly the first story. Now THIS was an awesome comic! This must be the funnest comic to write. 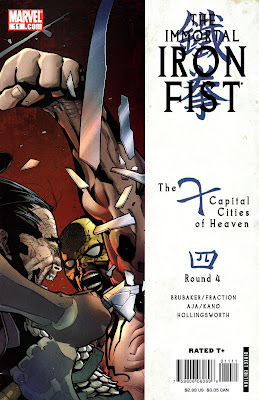 Particularly this storyline, with the kung-fu matches happening in every issue, complete with crazy awesome names for every move. And the bad guys are just so evil. I love it! This series rules so much because its pretty much the lone representative on the shelves currently of a very classic genre of pulp entertainment. And it's a really, really good representative. It's kinda like The Spirit in that way. I feel when I am reading it that it's a labour of love for everyone involved. I love this series, but why oh why must it constantly be tying into events? Particularly events that I have no interest in? If any comic should just be allowed to stand alone, it's this one. I get that they want to make Catwoman kinda badass again. This issue had her cutting off all her hair to symbolize her return to...I dunno...pre-One Year Later, I suppose. 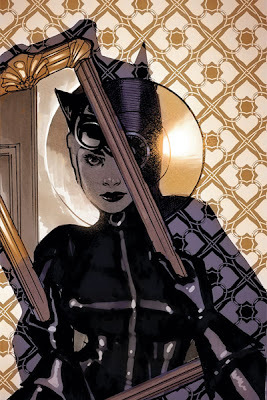 Forget everything you thought you knew and enjoyed about Selina Kyle, because now she's childless and being magically transported to Salvation Run! Why? I am guessing her books aren't selling well enough. 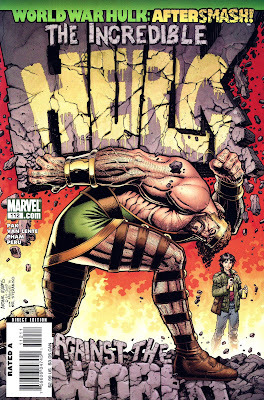 Which is too bad because its an excellent series, and was actually the best post-Crisis book going, for my money. But thank God they are doing away with all those pesky character developments that I have been very excited about for the past year and a half or so. Why stop at this reduction? 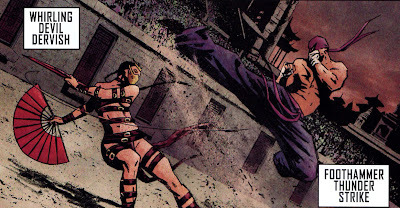 Let's just stuff her in the purple costume again and have Doug Moench write her. Argh. Sorry. I trust in Pfeifer to maintain the awesomeness of this comic through whatever muck the higher ups at DC decide to drag it through, because he's done a good job so far. I'm just frustrated because I love this series so much, and Selina Kyle is one of my all-time favourite fictional characters. This issue was good, and the art was beautiful as always, but I just wish it could be left alone. 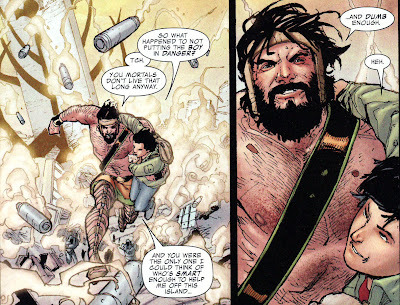 I guess I should be thankful that it wasn't part of the Ra's Al Ghul crossover. I think it's an interesting direction for the series. Now the team is fighting to get back in Superman's good books. The writing was great, even though it understandably needed to include a number of quick character introductions to get new readers up-to-speed. I really enjoyed Tony Bedard's short run on this, but I'm excited to see what McKeever's got planned. Marvel wins this week because I really enjoyed this comic too. The art, by Khoi Pham and Stephane Peru, was really excellent. 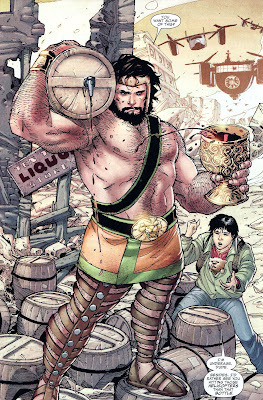 I'm really enjoying the team-up of Hercules and this Amadeus kid. They are a lot of fun together. Ahahahaha! 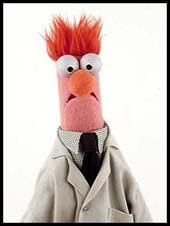 He looks like Beaker! Can you believe this series is up to issue #44 already? 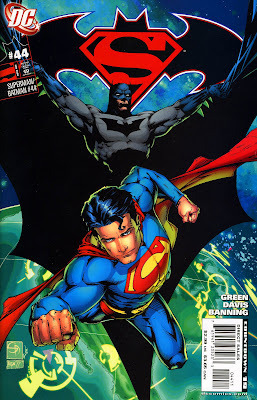 I do love that bold cover, though, of Superman busting right through Batman, ripping him clean in half. I'm not going to lie to you...I was looking forward to this issue because I could not wait to make fun of it. After Michael Green's absolutely absurd run on Batman Confidential, I was expecting nothing less than side-splitting unintentional hilarity out of this book. I wasn't disappointed. But I also didn't hate it in the way I thought I would. 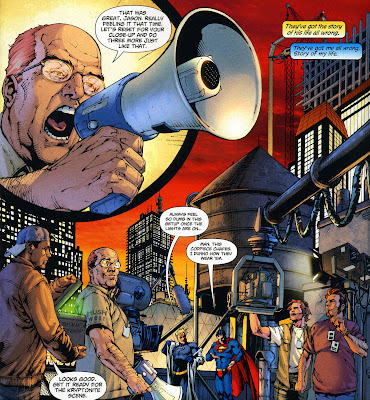 It actually captured my heart, much like my beloved Smallville: it's so stupid, it's almost charming. It opens with Superman and Batman secretly watching over the filming of a Superman/Batman movie (directed, apparantly, by Jeph Loeb). They are using real Kryptonite on the set as a prop for "realism." 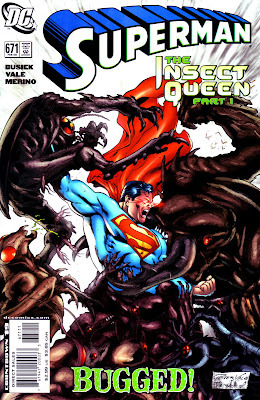 That's fine, except this comic also works in Smallville continuity, meaning that Kryptonite causes mutations in many humans. So...if that were the case...they probably wouldn't be using it on the set of a movie. It wouldn't be all that safe. Anyway, Livewire shows up and does her thing, which causes Kryptonite shards to fly everywhere, including into Superman's face and eye. So he goes down, and Flash shows up. Except Flash is a TOTAL DOUCHE! 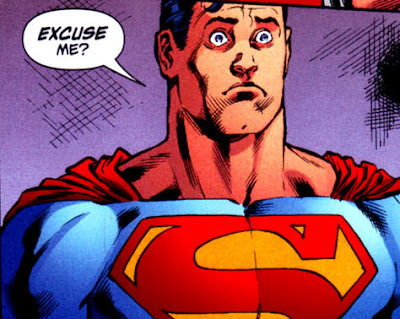 He just keeps ribbing Supes for being taken down by a "second-stringer" like Livewire. 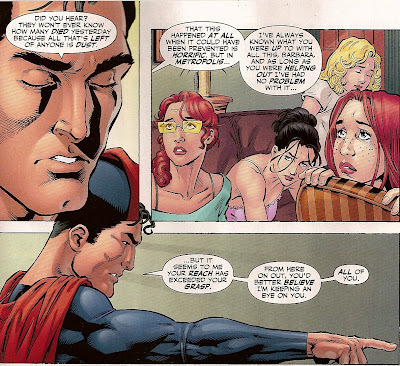 But, seriously, Superman has a face full of Kryptonite and he is dying. 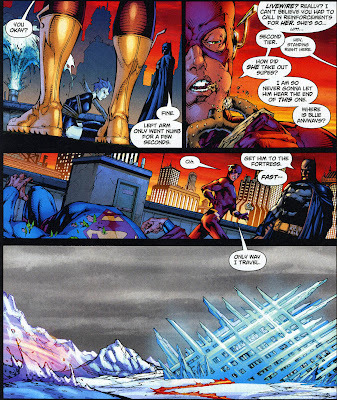 And Flash is being all "Man, I am never going to let you live this down." It's jarringly out-of-character for ol' Wally. 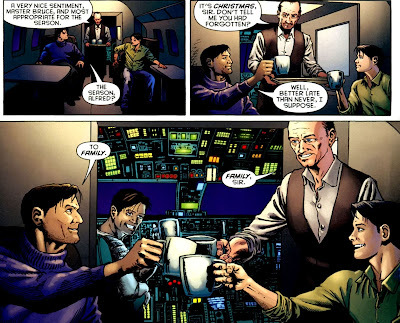 Anyway, they get Superman to the Fortress of Solitude, and Batman shows up with Alfred so he can remove the Kryptonite. Could they have taken Superman to the Batcave and it would have been easier for everyone? Yes. Of course. Superman does some thinking over the next few days, and then recruits Batman to help him rid the world of all Kryptonite. The issue ends with them realizing that there is an awful lot of it to round up. Good thing they have five more issues. 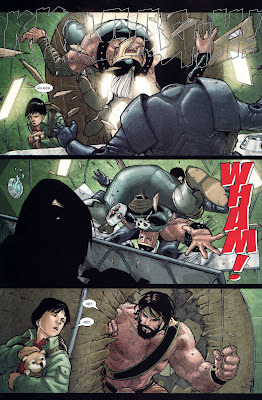 This comic had that thing that I love where superheroes team up to mess with people's heads! 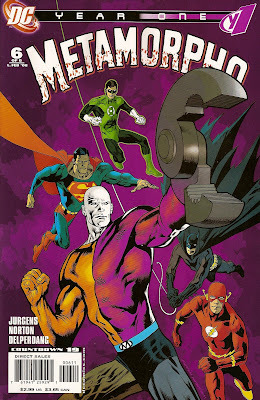 The JLA totally shows up in this issue and disguises themselves as bad guys so Metamorpho will fight them and show them what he's got. I love that stuff! This was a great ending to a very fun mini-series. Well done! But I'm still not reading Outsiders! ***Speaking of The Outsiders, Geo-Force got traded in this week's issue. 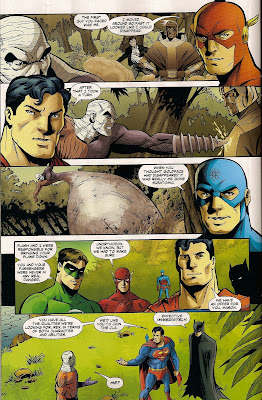 He's no longer a JLA member. Can they just do that? "Hey, Geo-Force...pack your desk. You're moving to the Outsiders." I will buy anything with David Hahn art. 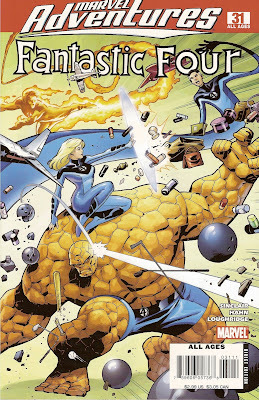 Plus, I loves me some Marvel Adventures comics. This was written by Kirsten Sinclair, who I admit I am unfamiliar with. The issue is a lot of fun. The FF go shopping! And The Thing gets a facial! It's very funny and the art, of course, is beautiful. Do check it out. All done! My scanner wasn't working all week, but I got it up and running again. So the posts should be flowing on a more regular basis. Comments are welcome. We can talk about anything...like how rad Grendel is, or how much I wish next week's comics...which are going to RULE...we're going to be late. Stupid holidays.